Cuestiones de Fisioterapia (Issues of Physiotherapy) is the scientific journal that is the means of expression and scientific circulation of the Sociedad Andaluza de Fisioterapia “SOFIA” (Andalusian Society of Physiotherapy "SOFIA") in collaboration with the Physiotherapy Research Group (CTS-305) at the University of Seville and the University of Alcalá. It has a four-monthly edition, setting an annual volume consisting of three issues published in the months of January, May and September. Cuestiones de Fisioterapia is regulated by the system of peer review and publishes in Spanish or English Original articles, Short Originals, Case Studies, Reviews, Editorials, Letters to the Editor and Special articles, concerning all the areas within the discipline Physiotherapy: clinical assistance, academics, management and education and health promotion, or which is relevant to this field of knowledge and profession-based care clinicians, with the express purpose of improving the quality of care to patients and other actions that make up the various professional roles of physiotherapists. 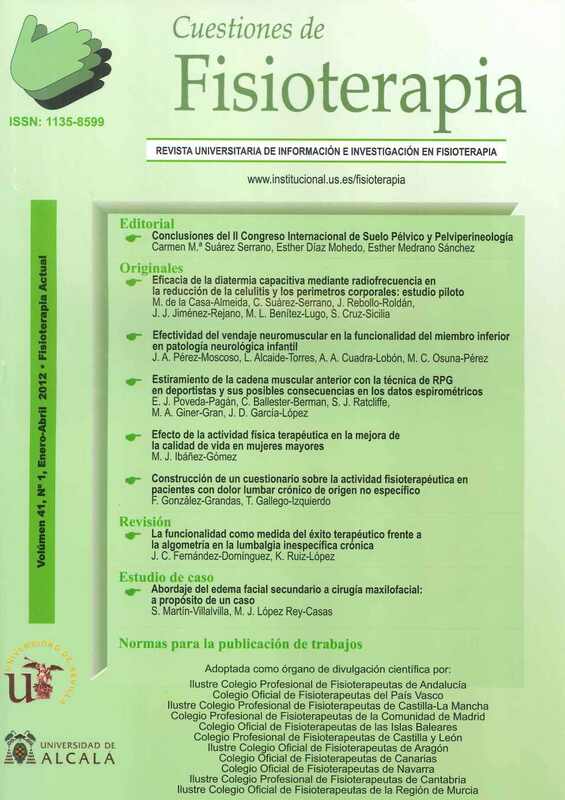 Cuestiones de Fisioterapia adheres to the Recommendations for the Conduct, Reporting, Editing, and Publication of Scholarly Work in Medical Journals of the International Committee of Medical Journal Editors (ICMJE Recommendations), revised in 2013 and available in www.icmje.org.